which will be used by major projects operators to source suppliers. projects Australia-wide - through an online tool called ICN Gateway (www.icn.org.au). already has 130 businesses registered. strengthen Indigenous businesses through increasing their exposure to major project work. Queensland Minister for Education, Training and Employment the Hon. 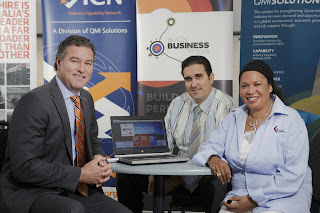 John-Paul Langbroek MP launches Black Business Finder with Indigenous business owners Dylan Sarra and Suzanne Thompson.